Another year has come to an end and it's time for Year 6 to move on to the next stage of their lives in secondary school. The children have had a year full of great learning opportunities, as you can see from our Class webpages, and some fun along the way too. They have worked hard, developed their growth mindset, overcoming challenges and seeking still more as they know this is the best way to get better. We would all like to wish them luck and look forward to catching up with all their news in the future. Using a range of different D&T skills and learning about how pneumatics can be used to make things move, Year 6 linked the Chester Zoo Sing for Songbirds project to a science and design & make task. Working with Mr Williams from TechnoEdUK, they each had an opportunity to explore this control system and build their own flapping songbird. Pictures below show some finished models and you can click on the link to see a video clip of a moving songbird on the @TechnoEdUK twitter. Year 6 had a great day at Chester Zoo as part of the Sing for Songbirds project, where we extended our learning about the endangered songbirds of Indonesia. Despite the very hot weather we managed to see a range of different animals and took part in 4 different workshops: Learning about captive breeding of Bali Starlings which are critically endangered; Sights and sounds of bird markets of Indonesia; Bird Feeder Making and Bird Watching for our native birds. We learned about how the Bali Starling population has been supported through a captive breeding programme and through working with local schools and community groups to re educate those who capture the songbirds to keep in cages. We saw real Bali Starlings, which were beautiful, too. We even had live music to accompany our lunchtime, provided by the writer of the Sing for Songbirds song we have been learning. We would like to thank Anya and Chester Zoo for inviting us to take part in this important project. This year we have been developing our coding skills using a range of programmes including Purple Mash 2Code and Infinity Code Lab. This week we had the chance to learn more about programming using Lego WeDo2. Working with Mr Williams, from TechnoEd, the children used iPads to access the software, following the step by step build instruction. They then learned the specific block coding to control ‘Milo’. They moved Milo, added sounds and developed the use of the sensors. They also videoed their progress to keep track of their sequences. Following this, many of the children shared their new skills, teaching some Year 2 and Year 4 children how to build and control Milo during a coding afternoon. Other children learned to programme ProBot cars, whilst others shared their Purple Mash 2Code skills with Year 2 partners. We are looking forward to extending our WeDo skills, tackling some of the challenge projects within the software. Fantastic oracy skills were shown, both by those working with younger children and those working with peer group partners. So much opportunity for reasoning, justifying, computational thinking, explaining, asking and answering questions….and of course it was great fun too! We also took part in sessions about drugs and alcohol and worked with PC Ashton. Our hands on Roman Day was a great success. Handling and wearing artefacts, trying out new skills, being archeologists, making mosaics and even learning a little Latin were just some of the opportunities offered to the children during this fantastic day. Year 6 had a fantastic opportunity to take part in a fully funded Techniquest KS2 to KS3 STEM transition project last week. The aim of the day was to teach the children about some of the different skills and activities needed in a secondary school science lab. The tasks included learning about the PH scale, making their own red cabbage indicator, learning how to follow instructions, and wearing safety clothing correctly, including lab coats, goggles and suitable gloves. The Year 6s were taught how to light matches safely, how to light a Bunsen burner correctly and then mixing some chemicals to make a 'fire extinguisher'. There was also a workshop to spot hazards in the lab and classroom. We had a fantastic day and also benefitted from being provided with some science resources to carry out some more science back at school. Thanks to everyone at Techniquest for a great day! On Wednesday 15th February, 20 Year 6 pupils (4 from each of our cluster schools) came to Northop Hall to explore number, pattern and shape in Vedic Maths. Each team of 4 were tasked with exploring the patterns created from a table square and digital roots. They investigated networks, circle patterns and Vedic worms. They also had to work together to create a display board to share their findings. We had a great afternoon and the children from Sandycroft, Ewloe Green, Hawarden Village and, of course, Northop Hall, were a credit to both themselves and their schools. This week were very lucky to be able to take 12 of our Year 6 pupils to take part in a Lego Mindstorms Coding project. This is the 3rd year we have been invited by Chester University to attend this event, run by PGCE student ICT teachers. 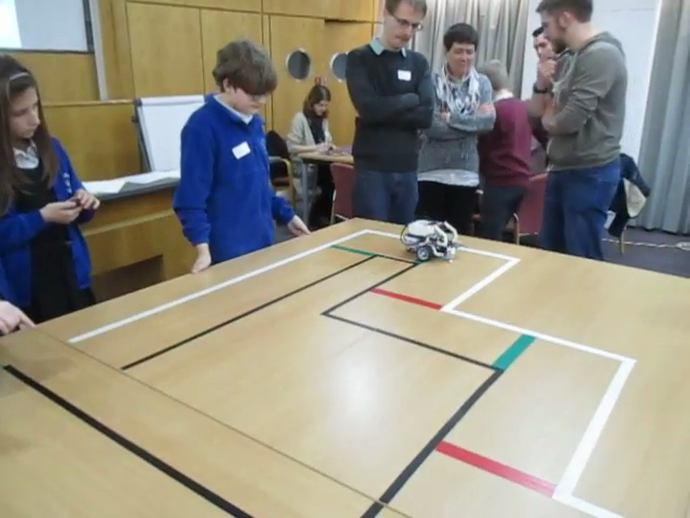 The challenge was to programme the Mindstorms Robot to complete a course, using its sensors to turn, stop and slow. For each team of 4 pupils, it was their first experience of this coding system, but the children were able to use their transferable skills from coding work in school, using 2Code in Purple Mash and Logo. The children worked brilliantly in their teams, listening to each other and sharing ideas to work out their code. Despite some technical problems with a couple of the robots, our teams posted some of the fastest times of the day. Well done to all. Science Day Fun and Learning! We investigated the effect of calcium on our bones by creating a chemical reaction to remove the calcium from an egg shell, we investigated our taste buds and took part in a Live Lesson on the BBC Terrific Science. Finally, we recreated a digestive system using chocolate cake, a potato masher and some tights, amongst other things! We had great fun despite it being a bit messy and we learned so many new things about our digestive system, the need for a healthy balance diet and about how we can teach ourselves to like new foods! Well done Year 6. You were 'eggsellent' scientists today, setting a great 'eggsample' to all of the other children by working so 'eggstremely' hard! On Friday 6th January 2017 we had a visit from Community Councillor, former parent of pupils in Northop Hall and local resident, Linda Thew. She came to visit Year 6 to talk about her relatives who have served their country in both World Wars. Some of her family members sadly lost their lives and are remembered on the war memorial in the village. Linda shared artefacts such as letters, medals, coins, uniforms and other items such as trench art and swagger sticks, as well as telling us the personal stories of her family members. Year 6 listened well, asked thoughtful questions and had the opportunity to handle the artefacts, even trying on some items of uniform. A great way to learn about history! We would like to say a big thank you to Linda and hope we will continue with our important links with our local community. Which walking boot would you choose to go up Snowdon- Yr Wyddfa? This was the question Year 6 investigated recently. They decided that it needed to be strong, long lasting, flexible, waterproof and have good grip! So the class decided to test the grip of a range of different footwear including walking boots, rock climbing boots, walking trainers and work boots. After planning a fair test and including repeat readings to help get reliable results, Year 6 used force meters to measure the force, in Newtons, each piece of footwear took to move. They worked well in teams, took accurate readings and analysed their results. Matthew is blogging from New Zealand! We have set up a Blog in Purple Mash (2Blog) so Matthew can Blog from his travels in New Zealand. Only Year 6 can follow the blog on our secure Purple Mash site. Some of Year 6 have already added comments to Matthew's blog, responding to his latest news. We are looking forward to seeing his adventures! Year 6 have a couple of tasks to complete over the next 3 weeks. Please see the information letter below for details. ​Today, Year 6 worked on a D&T project, building the most efficient Land Yachts they could. The children had to design the chassis shape, choose the wheel type and position and design the sail shape and position. They used their science understanding of friction and air resistance to help them make their decisions. ​A wide range of tools and equipment were safely used, including side cutters, craft knives, tuff cutters and hole punches. The children built individual yachts but needed to help each other out at different stages of the build. ​Finally, when all the yachts had been built, some fair testing took place in the Hall to find the most efficient one. A fan provided the equal force of the wind, markings on the floor ensured all started at the same place and finishing points were marked at the rear wheel after the yacht had come to a stop for 3 seconds. Some discussion took place then about how they could modify their design to improve it, with most thinking about reducing friction around their wheels or changing the sail shape to 'catch more air'. Well done Hannah for building the Land Yacht that travelled the furthest during our first test. ​Thank you Mr Williams of TechnoEd (see Twitter: @technoeduk) for such a fun day! Year 6 were all Superstars when they opened our KS2 Christmas play this year. They became the Celestial Choir, accompanying all the classes in their songs. Fantastic acting, dancing and especially singing, learning all of the songs so well! It was their last Christmas Play in Northop Hall and they did themselves proud. We have had a successful week with our Year 6 enterprise projects. Our sponsored run has raised £114 so far with a small amount still to come in. At the Christmas Fair on Friday we also made £52 from our Art pebbles with a few still unsold. Our School Council Eco Stall, organised and manned by the Year 6 pupils, also raised £63. We had a great visit to Dangerpoint today, where the children learned about and identified dangers and hazards in a range of settings, including the home, countryside, beach and near railways. Having scored 42% of correct answers in the quiz when we arrived, we then scored an amazing 97% when we did the quiz again at the end of our visit. Great listening and learning from Year 5 and Year 6! Can you spot the hazards in the photos below? We found worms ... and more worms. The main job for Year 6 on our exciting Orchard Day was to carry out a soil investigation to see the quality of the soil we were planting our trees in. We became 'citizen scientists' carrying out a survey which we then uploaded to a national survey. Using good science techniques, including fair testing (each group making the same size hole to analyse but in different places on the field) we counted and identified the worms we found. We also tested the drainage of each of our holes using 'mustard' water and timed how long it took the water to soak in. All of this was done with the help of Iwan Edwards from the North Wales Wildlife Trust, other volunteers, and of course our special visitor, Mike Dilger. Further photos are on the Gallery pages in the Children's section of the website. We will be selling our stunning decorative stone paperweights at this year's Christmas Fair. The artwork was inspired by our visiting outdoor artist, Tim Pugh, earlier this year. Stock is severely limited, so if you would like a piece of unique artwork, at the bargain price of £1.50, come over to the Year 6 stall! As part of our Enterprise Project this year, the children having been working on a balance sheet for their Year 6 account, discussing income, outgoings, profit, loss and breaking even. We hope to have regular 'business ventures' this year to raise money for activities or items for our class. This afternoon, Year 6 completed their sponsored run to raise money for the bus for our Dangerpoint trip. The majority of the class completed the continuous 15 minutes of running on a very cold afternoon. Well done to everyone and a big 'Thank You' to those of you who have supported us by sponsoring. Following our science investigations to test a range of different variables to find out which would help our spinners fall the slowest, Year 6 studied the four sets of results to decide on their criteria to build a 'super spinner'. Once built, the children used their explanation text writing skills to explain the reasons they had chosen the width, length, number of paperclips and material for their own 'super spinner'. Now we were ready for our completion. After a random draw we 'played off' against each other until we reached our 3 finalists Tom, George and Matthew. After a mini round-robin tournament, Matthew was declared the winner. He had chosen the combination of 10cm length blade, 4cm width, one paperclip for weight and paper for the build material. What a great and fun end to this science project. ​This year the children across school are getting involved in some enterprise projects, fundraising and covering aspects of financial education and learning about managing money. In Year 6 we have begun by fundraising towards our trip to Dangerpoint and we have been learning about profit, loss and breaking even. We are beginning with our 'sponsored run' on Monday. The children need to bring their PE kit to school on Monday and their sponsor forms too. ​We have also been creating stone 'paperweights' in the style of those that outdoor artist Tim Pugh showed us on his visit earlier this year. These will be for sale at the Christmas Fair, helping to raise money for our next class project. We hope you can support us and that we make a profit and not a loss! ​​Year 6 have had a fantastic day being Headteachers, Teachers and TAs when they took over the school. They showed what great communication and organisational skills they have as they planned and delivered lessons and carried out Headteacher tasks. ​All of the school staff said how impressed they were with their focus and skills. One of the best National Takeover Day groups we have had. ​Well done Year 6, I am very proud of you. On Friday 11th November, Year 6 took part in the Remembrance Service at St Mary's Church in the village and following at the village memorial for 11am. The children had written poems to read during the service, both in church and at the memorial. They also read a list of the names of the fallen from both wars, commemorated on the memorial in Northop Hall. Over the previous two weeks the children had been researching the members of the Northop Hall community who had served World War One, analysing the data and gathering details about the 11 soldiers who lost their lives during this conflict. This work became part of a display for the Local Community Village Heroes Project, which was set up in the church over the Remembrance weekend. We were very proud of the respect shown by the children on the day and by their wonderful, clear and poignant readings of their poetry. You can read their poems on the document below and see pictures of the day. What a fantastic morning Year 6 have had working with Welsh environmental artist Tim Pugh. Our Forest School is now full of natural artwork created from autumn leaves, stones, berries and sticks and twigs. We had an opportunity to make some pebble art at the end of our session using flat stones and marker pens. The children were so creative with their ideas and worked well both in teams and individually all morning. Thank you to Tim and to the parents who have contributed to allow us to have this session. After learning about gravity, friction and air resistance, Year 6 have been testing different variables on spinners to see which ones make a difference to how fast it drops. Each group changed one, different variable to ensure it was a fair test and they took repeat readings, calculating a mean average to help their investigation be more reliable. The variables they changed were the weight, the width of the blade, the length of the blade and the material. Their next challenge will be to use the different sets of data to build their own 'super spinner' for a class competition. I wonder who will win? Year 5 and Year 6 pupils have had the opportunity for some Athletics coaching, delivered by Laura from Flintshire Sports Development, this half term. She has been helping us prepare for the Indoor Athletics competition later in November. The children have been working on events such as relay, foam javelin, seated ball throw, standing triple jump and sprinting. 14 pupils from Year 6 have completed their Bikeability Cycle Training Course over two days. This important course teaches children about how to control their bikes safely and also teaches them about riding on the road using correct road position and signals and being aware of the traffic and pedestrians around them. All 14 children passed their Level 1 training with a large group passing the much more challenging Level 2 training. Congratulations to everyone who took part, the trainers said how polite and hardworking they all were. It was great to see some of you at our reading meeting last night (Monday 18th October). If you were unable to attend, there are some resources and links you may find useful below, and some further information In the Parents/Curriculum/Reading section of the website. Accurate spelling is a life long skill that we need to help our children develop. We will be using the same system of spelling this year, with two books, one yellow with lists to learn, and one red for the tests. the children will need to have BOTH books in school on a Friday. Spelling lists may vary from child to child, will sometimes include words specifically identified from daily work and we will build on these spelling patterns or include related words. They may also have lists of words targeted at their age range, specific need or specific topic words that will be used in our classwork. Overall the children will learn patterns as well as individual words, key words and topic vocabulary lists at times. Although we will have regular spelling tests the true reflection of whether a spelling has been retained is when it is used accurately in classwork. Congratulations to our newly elected Year 6 pupils who will be the School Council representatives this year. They will work with the rest of the School Council to organise events, help improve the school and work on some fundraising. We're excited to find out who will be joining them from the other classes. The School Council is an important part of Northop Hall CP as it allows the pupils to have a voice in things that happen in school. Check out the School Council section of the website to see some of the things they were doing last year.